The Caribbean-inspired Loews Sapphire Falls Resort at Universal Orlando Resort transports guests to paradise where blue waterfalls cascade across lush grounds, and the invitation to cool relaxation is everywhere. Join us for a look around the exciting new Sapphire Falls Resort at Universal Orlando Resort. 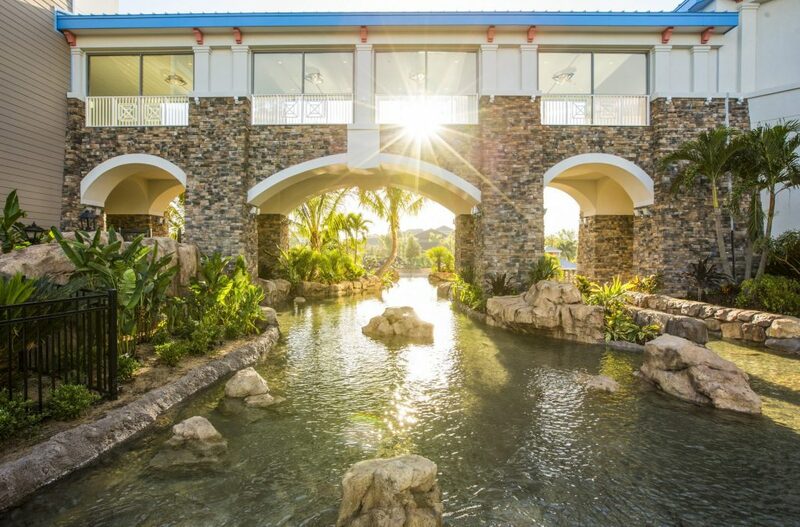 This hotel is now open guests are loving the features like its beautifully landscaped, resort-style pool with a water slide surrounded by cascading waterfalls. With 1000 guest rooms and suites and exclusive theme park benefits, the spacious, comfortable and picturesque hotel is quickly becoming a favorite at Universal Orlando. Guests staying at this on-site hotel enjoy exclusive theme park benefits at Universal Orlando® Resort including Early Park Admission* to The Wizarding World of Harry PotterTM one hour before the theme park opens; complimentary water taxi and shuttle service to and from the Universal Orlando theme parks and Universal CityWalk™, and much more. Loews Sapphire Falls Resort offers an island escape in the heart of an unforgettable adventure. Reminiscent of a leisurely estate in the heart of the tropics, every comfort has been built into this brand new jewel. With a luxuriously landscaped 16,000 square foot, resort-style pool surrounded by cascading waterfalls as its centerpiece, Loews Sapphire Falls Resort captivates at every turn. From the ruins of the stone turret in the lobby to the inviting island charm of the 1,000 guest rooms and suites, guests will be surrounded by a vivid and textured haven that is old-world and chic while still modern and timeless. Loews Sapphire Falls Resort offers an island escape in the heart of an unforgettable adventure.